Vajrakila (Tib. Dorje Phurba), or Vajrakilaya, meaning the ‘Dagger of Indestructible Reality’, is one of the Eight Herukas (Tib. ka-gye) or wrathful meditational deities of the Nyingma Mahayoga transmissions. He is a wrathful activity-aspect of Vajrasattva and Vajrapani who is associated with the Karma or Activity Family of Amoghasiddhi Buddha; and his consort, Diptachakra, is regarded as a wrathful emanation of Green Tara. The powerful tantric practices and rituals of Vajrakila are designed to remove both inner and outer obstacles, where the inner obstacles are the afflictive emotions of the ego, and the outer obstacles are negative forces that are eliminated through the performance of the four rites of pacification, enrichment, subjugation, and wrath. The teachings of Vajrakila were introduced into Tibet by Padmasambhava, who taught them to some of his main disciples, such as Yeshe Tsogyal and King Trisong Detsen. The practice lineages of Vajrakila as a major yidam deity are now of particular importance in both the Nyingma and Sakya traditions of Tibetan Buddhism. 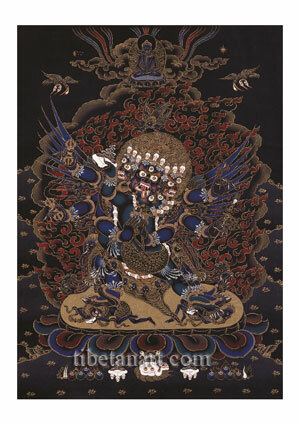 Vajrakila is wrathful and blue-black in colour, with three faces, four legs, and six arms. He stands in pratyalidha posture as he leans towards the right upon a golden sun disc and a multicoloured lotus. With his two right feet he tramples upon the forehead and back of Rudra (Mahadeva), who lies face down upon the sun disc. And with his two left feet he tramples upon the breasts of Rudrani (Mahadevi), who lies on her back facing upwards. These two figures represent the two extremes of samsara and nirvana, and they both hold the attributes of a skull-cup and a curved knife. Vajrakila’s three faces are white (right), blue-black (centre), and red (left), which respectively indicate his triumph over the three poisons of ignorance, aversion, and attachment. Each of his faces are extremely fierce, with three round red eyes, upward-blazing facial hair, and a gaping mouth that reveals its four sharp fangs and twisting red tongue. His central blue face symbolizes the dharmakaya and has a formidable and terrifying expression. His red left face symbolizes the sambhogakaya and has a haughty and angry expression. And his right white face symbolizes the nirmanakaya and has a jocular and youthful expression. Each face is adorned with a crown of five dry white skulls, which are topped with coloured jewels to represent the Five Buddhas. His upward-streaming hair is tawny-yellow in colour, with a central topknot that is sealed by a half-vajra and bound by a small snake. Within the hub of this vajra dwells blue Akshobhya Buddha, the ‘Lord of the Vajra Family’. Vajrakila’s powerful body is adorned with the ‘ten glorious attires of the charnel grounds’. His forehead is marked with three horizontal lines of cemetery ash. The three bulges of his cheeks and chin are smeared with the heart-blood of Rudra, whose consciousness he has liberated. His chin and throat are smeared with human fat. The freshly flayed and bloody skin of an elephant is stretched across his back. He wears a human-skin as a shawl; a tiger-skin loincloth; a garland of fifty freshly severed heads; and the limb ornaments and a sacred-thread of writhing serpents. Together with his upward-pointing blue vajra-wings and the blazing mass of wisdom fire that surrounds him, these comprise the ten wrathful attires of the charnel grounds. His red beard, moustache and eyebrows blaze upward like fire, emitting fiery sparks that conflagrate all maras and obstacle makers. His vast vajra-wings are spread and point upward towards the sky, and are fashioned from jewels (wisdom) and vajras (method). The five-coloured wreaths of ‘revolting serpent ornaments’ that adorn his limbs and chest represent the five Hindu castes of the nagas: warriors (white); merchants (yellow); Brahmins (red); commoners (green-blue), and untouchables (black). The grey ash, red blood, and white fat that are smeared upon his face like war-paint respectively represent the dharmakaya, sambhogakaya and nirmanakaya, and his triumph over ignorance, desire and aversion. With his first two right and left arms he embraces his consort as he rolls a ritual dagger (Skt. kila; Tib. phurba) with three triangular blades between his open palms. This dagger is described as being massive like Mt Meru, and its three blades represent the transmutation of the three poisons of ignorance, attachment and aversion into the three nectars of wisdom, compassion and power. With his second right hand he holds a golden five-pointed vajra; and with his third right hand a nine-pointed golden vajra with open prongs above. With his second left hand he holds a khatvanga crowned with a trident; and with his third left hand he makes the threatening tarjani gesture as a blazing stream of wisdom fire emanates from the palm of his hand. His consort, Diptachakra (Tib. Khorlo Gyendepma), the ‘blazing wheel’, is a lighter shade of blue in colour, with a fierce face, three eyes, two arms and two legs. In the bliss of sexual union she presses every part of her body against his, with her left leg wrapped around his waist, and her outstretched right foot also presses upon the body of Rudrani. Diptachakra is youthful and nubile, with full breasts and a narrow waist, and she wears a leopard-skin loincloth, golden ornaments, a five-skull crown, the five bone ornaments, and a long garland of fifty dry white skulls. With her left hand she holds aloft a skull-cup of warm swirling blood, and with her right arm she embraces the neck of her lord while holding a blue lotus flower in her hand. Although in other traditions she may be described as holding a khatvanga, a wheel, or a bell in her right hand. Vajrakila and Diptachakra are surrounded by a blazing mass of wisdom fire, with billowing clouds behind, and above Vajrakila’s hair is the serpent-devouring form of a flying Garuda. Seated amidst clouds and rainbows at the top centre are the naked forms of the blue Primordial Buddha Samantabhadra and his white consort, Samantabhadri. And in the sky are two vultures that carry eyes and intestines in their beaks and claws. In the lower foreground is an upturned skull with scalped hair that contains the five torn-out sense organs of eyes, ears, a nose, a tongue and a heart. Flanking this wrathful sense offering are two skull-cups that contain swirling blue nectar and fresh blood. And on either side of these skulls are jewel offerings and the seven emblems of a chakravartin or ‘universal monarch’.